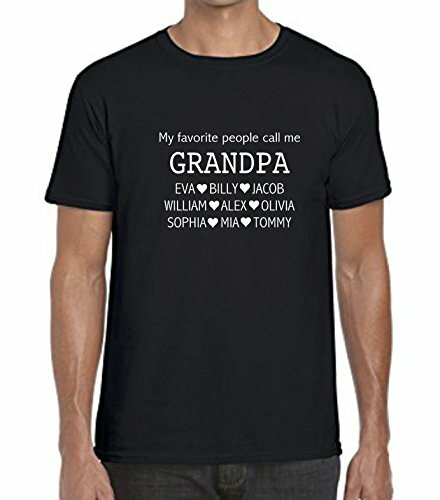 Personalized Grandpa T-Shirt - Father's Day - My Favorite People call me Grandpa: Child names - Gift for Him Tee TShirt Shirt - Father's Day by Silmple Passion for Designs at Nicky's Blog. Hurry! Limited time offer. Offer valid only while supplies last. This shirt comes in sizes ranging from S to 3XL. Materials: The solid color shirts are 100% cotton. The heather shirts are 50% cotton 50% polyester. This shirt comes in sizes ranging from S to 3XL. Materials: The solid color shirts are 100% cotton. The heather shirts are 50% cotton 50% polyester. Gray is 90% cotton and 10% polyester. Quote is made from high quality heat transfer vinyl that won't crack or peel. Machine washable. Thank you for visiting my Shop! If you have any questions about this product by Silmple Passion for Designs, contact us by completing and submitting the form below. If you are looking for a specif part number, please include it with your message.